Informational note: The most common Texas lake stocking strategy is to combine largemouth bass and bluegill (or largemouth bass, bluegill and redear sunfish). The combination generally works well in ponds or lakes larger than 1 acre and provides excellent fishing for both species indefinitely. The beauty of the bass and bluegill lake stocking system is its simplicity. 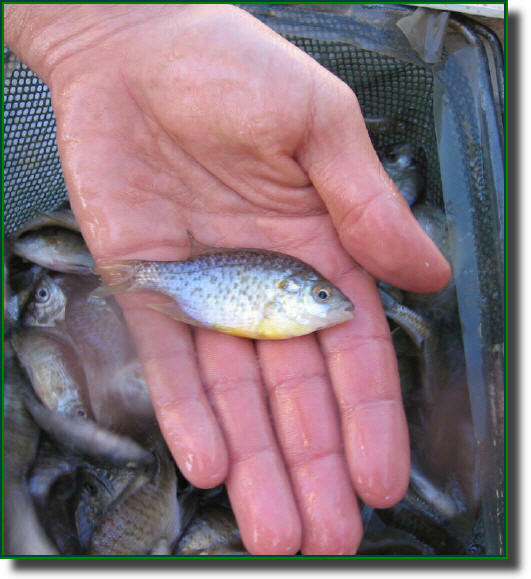 In a well-fertilized fishing lake, zooplankton and insect larvae will be plentiful enough to supply food for bass fry and all sizes of bluegill. The bluegill will reproduce and grow rapidly with the abundant food and provide excellent forage (food) for the bass. If bass are not over-harvested, they will keep the bluegill from overpopulating. Some large bluegill will survive bass predation to provide good bluegill angling. Central Texas trophy fishing lake with fish feeders in place on the banks. It was a brisk day in mid- January. 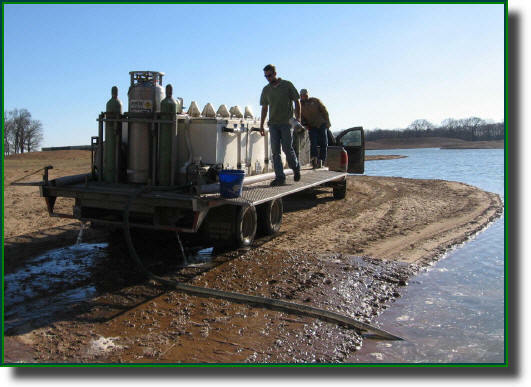 The Oakwood, TX Trophy Fishing lake was complete and had been filled by pumping water from a nearby oxbow of the Trinity River. 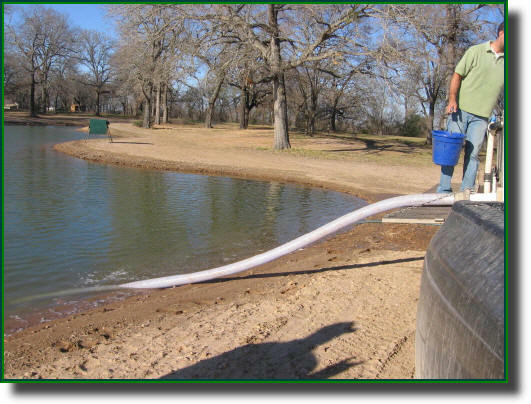 Fish structure had been placed on the bottom of the 4 acre lake prior to filling and multiple aeration stations were also in place. Automatic solar powered fish feeders had been placed on the bank to provide the new fish with a food source until natural food sources became available. Acclimating new fish stock before they are released into the trophy fishing lake. The truck from the fish hatchery arrived with a selection of 4 different types of fish which included Redear Sunfish and Fathead Minnows. The large tank on the rear of the fish hatchery trailer contains liquid oxygen which keeps the young fish in the best possible health during transport. 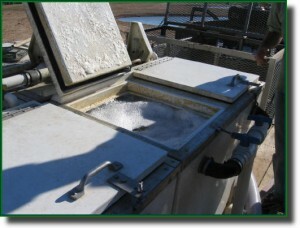 In this picture, lake water is being pumped through the tanks containing the fish to acclimate them to the temperature of their new environment before they are released into the fishing lake. Choosing the right fish hatchery is an important decision in your lake management plan. The hatchery must have the proper equipment, the knowledge and healthy fish! They should also become a partner in managing the fishing lake as it matures. Proper lake management will insure that you reap the maximum benefit and pleasure from the newly constructed fishing lake. 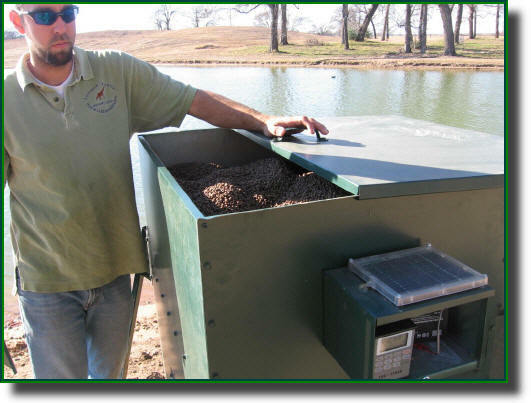 Informational note: Private fish hatcheries will deliver directly to fishing lakes or ponds and can provide fish at almost any time of the year. Many offer varieties or hybrids that have been selected for rapid growth and perform well in your local environment. Soilmovers LLC can help you with the selection of a reputable fish hatchery and make sure you have a good lake management partner based on our prior experience with these fish stocking contractors. Each transport tank holds a different fish species and is inspected prior to release in the fishing lake. 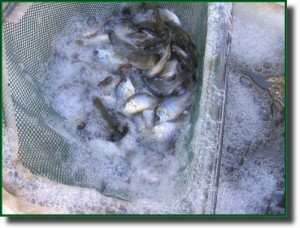 Stocking of 3- to 5-inch bluegill is most often done in the fall or early winter. 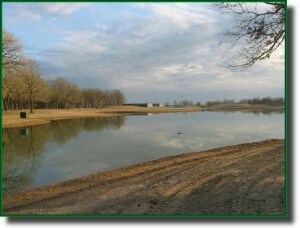 The bluegill will grow and spawn by the following spring. Bass are stocked in late May or June and grow rapidly, feeding on the new bluegill fry. Bluegill will spawn two or three more times before fall, providing adequate forage for the bass. 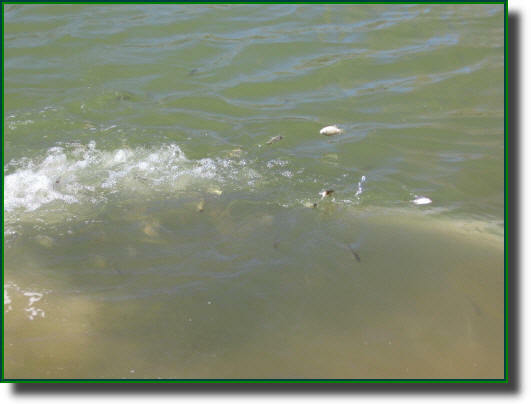 Bass growth should average 1/4 to 1/2 pound in the first year and can approach 2 pounds if forage is plentiful. A hatchery transport tank full of healthy, vigorous young fish. Each tank holds a different fish species and is inspected prior to release in the lake. The frothy foam on the top of the tank is from a protein solution that is added to each tank prior to transport. The protein solution helps to ensure the optimum health and vigor of the new fish. An automatic fish feeder is checked for proper operation. Inspection of the automatic fish feeder to make sure it is operating correctly. Note the solar panel on top of the control box. The feeder is compact and not very obtrusive and entirely necessary at this point in the lake management program. Discharge hose on the hatchery truck pumps the new fish into the fishing lake. The new fish are introduced to their permanent home. … and the new fish are introduced to their permanent home. If you want to catch a good fish then you need to build a good fishing lake!